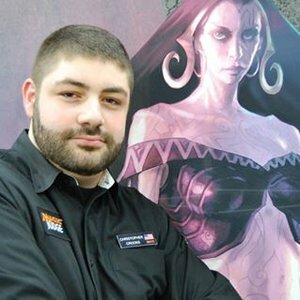 This week we feature a judge known all over the world for grinding a lot of GPs! Currently, he is a GP Head Judge and a more-recently a Program Coordinator as well! He focuses on team leading and relationships with other people. If you don’t know him yet, meet CJ in this edition of Judge of the Week! Judge start date: I started playing Magic in 1995 and started judging during Shadowmoor. 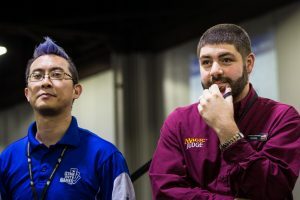 Commander General: My first experience playing EDH was in a Charity Tournament with a deck loaned to me by Ben McDole . Sheldon Menery was in my first pod, turns out he had experience playing against the deck. The game lasted long enough for me to remember it happened, but I couldn’t tell you the general. Best tournament result: 1st Place. Random fact about yourself: I teach leadership skills to incoming high school seniors every summer through a Rotary program. I opened a FLGS in Florida and wanted to provide a better play experience for customers. At the time, TOs couldn’t play in any event they organized so I didn’t have much else better to do! Judging gives us a perspective into teamwork and leadership that is hard to find elsewhere. I would hope that I’ve become a better communicator, team member, and problem solver because of the fabulous mentors that Magic has provided. You were nominated for your desire to see other judges to improve and to work hard in a way you can have fun at the events. Do you have any strategies about this you can share with us? Everyone needs to find what they enjoy about judging. It’s usually not what brought us to our first event that keeps us going. I am definitely a Selesnya judge, I enjoy watching people grow to meet the challenges around them. My advice is find a challenge you would enjoy (not everyone has the same aspirations) and figure out the appropriate gradients to get there. Helping other people get better at the things they enjoy. I think Steven Briggs may be sick of my random messages by now. Could you describe what the Program Coordinator role means? The judge program is a massive organization. Over the years we’ve done a great job of separating the workload necessary to plan and execute phenomenal player experiences across the globe while also offering judges opportunities for growth and comradery. I like to imagine the program as a giant caravan of cars. Each RC is driving their car. Each sphere lead and project lead is driving their car. Grand Prix Head Judges can usually be found swerving through lanes. The Program Coordinators are the ones tasked with making sure all the cars are headed in the same direction, toward clearly defined goals using road maps that make sense. What are the PCs meant to do, in broad terms, and how do they go about accomplishing those goals? We run the program with the help and consultation of the Regional Coordinators and Sphere Leads. Regional Coordinators are vital to implementing any plans we as Program Coordinators have and Sphere leads are crafting the tools necessarily for those goals to be accomplished. As new Program Coordinator, what is your number one goal for the judge program? I have three primary goals right now. First is to handle issues that the judge community raises and believes to be the most important. I would be remiss as a leader to focus on my goals without acknowledging what those around me want. Second, the creation of a level system that makes sense with the Organized Play structure that exists. And finally, the creation of self-education modules we can use to help bridge the gaps between levels. What changes or improvements do you think the judge program needs the most? I would submit our feedback culture needs more attention. Written reviews are on the decline and anecdotal evidence suggests that many judges are unwilling to listen to or accept a negative evaluation of their efforts. Learning through mistakes is critical to advancement. One of my favorite quotes comes from (disputably) Thomas Edison when he said “I have not failed. I have just found 10,000 ways that didn’t work.” We have all made bad calls or poor logistical choices while running an event. Now we just have to find ways to learn from those mistakes and hope others help us along the way. What have you found to be the greatest struggles with the Program Coordinator role? Getting the server at a judge dinner to put a BoomTube in Ben McDole ‘s mashed potatoes. 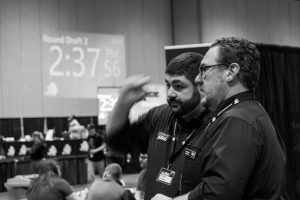 I had the opportunity to judge in the 2017 World Championships. It was a surreal experience. It’s not often I am one of the least experienced judges on a staff anymore. Working with several of my role models in the judge program was simply fantastic. I would count my bests friends among people I’ve met in the judge program. Joe Sapp is teaching me Judo (you should google Joe Sapp and Judo), Bryan Spellman is teaching me to dance, and Matthew Johnson is teaching me to cook. Finding new ways to connect with all the friends I’ve made in the program. Return each creature card from your graveyard to the battlefield. Creatures returned this way gain haste until end of turn. 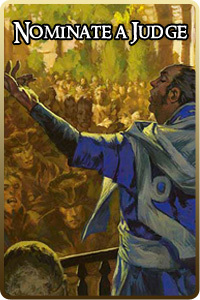 One of the Tolarian Academy’s founders. The Tolarian Academy was created to train an elite cadre of mages to Dominaria’s defense. I have a facebook group of up and coming judges who will probably take over the world. So that’s the same right? I studied Ancient History in college and submitted a thesis on Management Techniques Learned from the Greek Senate. My brother and I are going to open a tap house called Captain Crooks. Even though he was in the military, he envisions a Fishing Captain. My favorite contemporary artist is Octavio Ocampo. My wife and I have an original piece and several others in our home. Tomasz Ludkiewicz is a nice person and he feels no hatred towards anyone or anything. So the statement about him and bananas was not true.